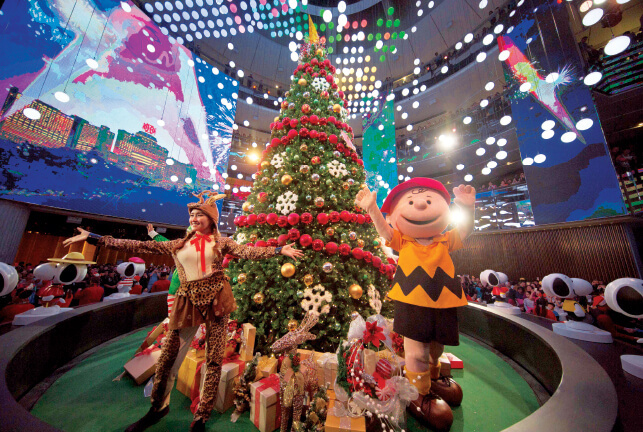 Genting Highlands was lit up for Christmas last Friday with much fanfare, with showcases and an appearance by popular characters such as Snoopy, Charlie Brown and, of course, Santa Claus at the SkyAvenue mall. Kicking off the proceedings, Resorts World Genting assistant vice-president of promotions and entertainment Roger Ong said in his opening remark: “The Spectacular Genting SkySymphony Christmas Show”, with the theme Rockin’ Around the Christmas Tree, is another world-class entertainment that the resort has introduced to add excitement for visitors and our hotel guests. When the music halted and lights dimmed for a minute right after delivering his message, Christmas carollers came down, over a 6ft high round stage in the Times Square section of the mall to prepare for a show among a large crowd on the floor. On stage, 13 Snoopy figurines stood majestically while heightening the festive vibe. Amid images shown on a four-storey high LED screen, 1,001 light bulbs, programmed to move quickly, formed different shapes and colours to reflect a story heard on speakers in the background. The story unfolded with a snow globe showcasing a wintry Christmas village, and accompanied by upbeat festive songs. Visitors also enjoyed witnessing Santa’s factory where dozens of staff members, dressed as elves, busily made gifts for the special occasion. Santa’s reindeers, soft toy replicas of bears, and the fairy tale character Gingerbread Man were among the festive icons shown on the LED screen while the story continued to highlight the elves at work. Lasting almost five minutes, the story ended with the finished gifts rolling off an assembly line and placed under a 20ft Christmas tree that rose from beneath the stage, surprising many visitors. The fun occasion continued with the carollers serenading the audience with songs and an energetic dance performance that prompted some of the visitors to follow suit. The show, costing over RM500,000, generated a great buzz for Genting. The SkySymphony Christmas Show is held at every two-hour interval. Three other shows with stories entitled “The Forest”, “Urban Symphony” and “The Goddess” are also featured on an hourly basis, from 10am to midnight daily, until Dec 31. You can look forward to the “Snoopy and Charlie Brown with Friends Meet and Greet” session as well. Santa Claus, santarinas, the elves, Snoopy and Charlie Brown will also be seen in parades on the streets in Genting. Catch these spectacles daily at Level 1, SkyAvenue, from 11am to 11.30am, 3pm to 3.30pm, and 8pm to 8.30pm; or at Level 3, SkyAvenue, from 1pm to 1.30pm, and 6pm to 6.30pm.